This paper analyses the question of relative authority and separation of powers with regard to the European Court of Human Rights (ECtHR). Focus is on the specific processes that might perpetuate and even bolster authority in complex regimes of global governance such as the ECtHR. Building on a previous work on the variable authority of ICs, and notably how contexts shape that authority, the paper is particularly interested in how inter-institutional processes and feedback mechanisms operate in practice and create workable ensembles of institutions exercising relative authority. The chapter’s empirical analysis focuses on four instances of law-politics interfaces in the evolution of the ECtHR. It highlights particular moments in which the authority of the ECtHR has been challenged and how such challenges have either been overcome or resulted in insolvable collusions between the Court and the Member States. The analysis concludes that the current informal system of checks-and-balances in some cases is insufficient for avoiding clashes over the Court’s interpretations of the ECHR. Against the background of the empirical analysis, the paper develops original proposals for institutional reform that might help create better feedback loops in the area of European human rights. These include a different role for the Committee of Ministers, a greater participation and transparency with regard to proceedings before the Court, and the introduction of a form of appeals system. All of these proposals can be introduced in the current system with only minor amendments to the existing framework. The issue of causation has been surprisingly overlooked in the area of international human rights law. The objective of this article is to fill this gap by investigating how the ECtHR finds causal connections between harm and state omissions within the framework of positive obligations. By engaging with causation, this article seeks to partially address the widely voiced concerns about the indeterminacy that clouds positive obligations in the case law. Four main arguments are articulated. First, assessments whether the state knew, or ought to have known, about the (risk of) harm, whether demanding state action is reasonable and whether harm is caused by state failures, are merged and affect each other in the enquiry as to whether the state has failed to fulfill its positive obligations. Second, the level of state control structures lines of causation. Third, since the question as to how much control the state should have could imply normative judgments in which the Court might not want to see itself implicated, and since empirical and epistemological uncertainly might hamper assessments of causation, the Court has recourse to techniques to avoid direct resolution of these normative issues and uncertainties. Two such techniques are discussed: domestic legality and national procedural guarantees. Finally, even in cases where omissions might be causative to harm, additional considerations might militate against finding the state responsible under the ECHR: reasonableness, no immediacy of the harm and no systemic failures. The European Court of Human Rights (ECHR) searches for human rights policies that are adopted by the majority of the countries in Europe. Using a doctrine known as "emerging consensus," the court then imposes these policies as an international legal obligation on all the countries under its jurisdiction. But the ECHR sometimes defers to countries, even if their policies fall short of the standard accepted by most of the countries in Europe. This deference is accomplished by using the so-called "margin of appreciation" doctrine. Naturally, emerging consensus and margin of appreciation are often conceived as competing doctrines: the more there is of one, the less there is of another. This paper suggests a novel rationale for the emerging consensus doctrine: the doctrine can allow the ECHR to make good policies by drawing on the independent decision-making of many similar countries. In light of that, the paper demonstrates that a correct application of the margin of appreciation doctrine actually helps emerging consensus reach optimal results, by giving countries an incentive to make their policies independently. An important ‘stress test’ for regional human rights courts would be to see how well such courts perform when faced with authoritarian, human rights-violating regimes that they are supposed to hinder or constrain. These states are not only subjects of the court, but also its masters insofar as they enjoy various forms of control and accountability mechanisms that may constrain the court’s independence. The article argues that, at least in the case of the European Court of Human Rights (ECtHR), its precarious ‘constrained independence’ should be modified to enhance its impact even under such circumstances. Such changes could strengthen the ECtHR’s impartial and independent role without running the risk of turning it into a so-called ‘juristocracy’ - subjecting European states to the arbitrary rule of international judges. In the same theme of last week's book announcement, another recent book also offers practical insights on how to conduct a case, whether as applicant or third party intervener. 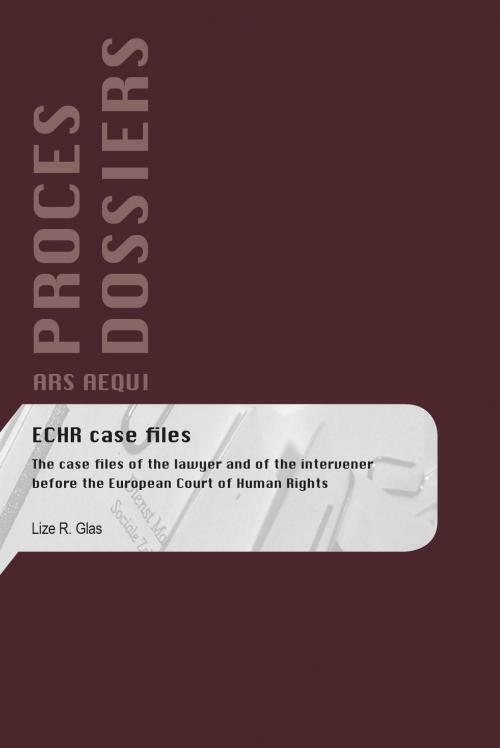 Lize Glas (Radboud University Nijmegen) has published ECHR Case Files.The case files of the lawyer and of the intervener before the European Court of Human Rights with Ars Aequi publishers. 'Ars Aequi Procesdossiers (case files) are written primarily to give the reader insight into different legal procedures. Relying on real case files, it is explained step by step how an actual procedure develops. The Ars Aequi Procesdossiers contain original procedural documents which, together with the accompanying text, draw the reader’s attention to the main features of the relevant laws. In this way, the material is brought to life. 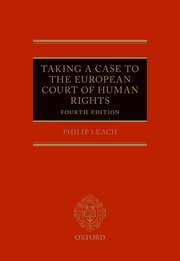 'This book provides comprehensive coverage of the law and procedure of the European Court of Human Rights. It incorporates a step-by-step approach to the litigation process, covering areas such as lodging the initial application, seeking priority treatment, friendly settlement, the pilot judgment procedure, just satisfaction, enforcement of judgments, and Grand Chamber referrals. 'Over the past decades the European Court of Human Rights has been increasingly engaged in constitutional decision-making. In this time the Court has decided whether abortion, assisted suicide, and surrogate motherhood are human rights. The Court’s judgments therefore do not just affect the parties to a particular case, but individuals, other member states, and often European society at large. Unsurprisingly, a variety of entities such as non-governmental organisations, try to participate in the Court’s proceedings as third-party interveners. Acknowledging a certain public interest in its decision-making, the Court accepted the first intervention in 1979. Since that time, interventions by individuals, member states and non-governmental organisations have increased. Yet despite this long-standing practice, third-party interventions have never been fully theorised. Third-Party Interventions before the European Court of Human Rights is the first comprehensive and empirical study on third-party interventions before an international court. Analysing all cases between 1979 and 2016 to which an intervention was made the book explores their potential influence on the reasoning and decision-making of the Court. It further argues that there are three different type of intervention playing different roles in the administration of justice: amicus curiae interventions by organisations with a virtual interest in the case which strengthen the Court’s legitimacy in its democratic environment; member state interventions reinforcing state sovereignty; and actual third-party interventions by individuals who are involved in the facts of a case and who are protecting their own legal interests. 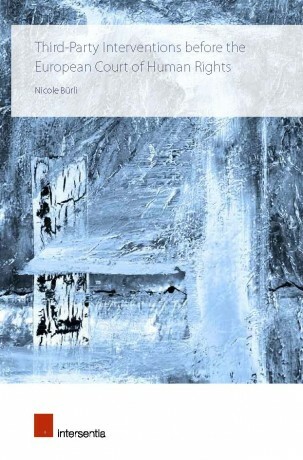 As a consequence, the book makes a plea for applying distinct admissibility criteria to the different type of interventions as well as a more transparent procedure when accepting and denying interventions.